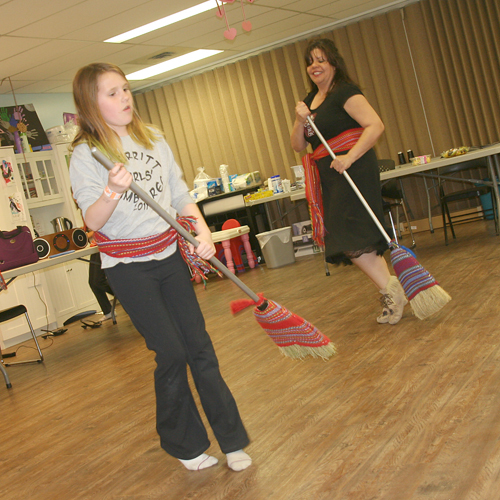 Nine-year-old Jorden Petersen practises the broom dance with Lucier, who stood in for dancer Dani Turmel, also nine, who was away sick. A new dance group has sprung up in Merritt. The Métis jiggers are a group of young girls who are dancing to connect with their Métis roots. In six months of practices, the four group members have learned jigging steps and five dances. Instructor Colleen Lucier comes from Kamloops at least once a month to teach the dancers Métis jigging steps. Between lessons, the girls practice on their own. So far, the girls’ practice seems to be paying off. While Lucier said it took her about a year to learn one particularly complicated step called “around the world,” 11-year-old Talyn Ferch said it took her one session to learn it. Ferch said she and some of the other girls jig during recess at Diamond Vale Elementary. “They’re all naturals at it,” Lucier said. Lucier is aided by local volunteer Cecilia Dumont, who helps the girls fine-tune their steps. “We wanted to see children and teenagers try to find a way to get them off the streets and show them how an activity of the Métis can be,” Dumont said. “They’ve been doing very well,” she added. Ferch said her favourite dance is the sash dance, which involves she and 11-year-old Mackenzie Wray doing the “around the world” step over a pair of crossed sashes. 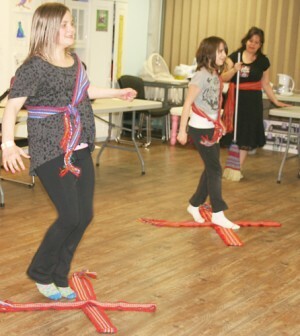 “Your sash dance is influenced by Scottish dancing because our culture was influenced by First Nations and different Europeans,” Lucier told the girls at a practice at Merritt Moms on April 16. Nine-year-old Jorden Petersen said her favourite dance is the broom dance, in which she passes a broom quickly between her hands underneath her legs. “Right now, we’re practising perfection, because we’re trying to make it go faster,” Ferch said at their practice. Although its current members are all girls between nine and 11, the group is open to boys as well and has no age restrictions. Lucier said the group she dances with in Kamloops is mostly adults, but in Merritt, youth have taken to it. “Our work is to help youth and families feel that sense of belonging, and dancing is a great way and it’s been a fun way to listen to our music and meet our elders and learn some of our culture,” she said. Further, she said, you don’t have to be Métis to dance with the jiggers. The troupe will have its first performance at the Métis community potluck on April 25 starting at 5 p.m. at the cadet hall. “We’re available to perform at local functions and highlight our Métis culture and the local Métis culture. There’s a large Métis community in Merritt that I wasn’t aware of until I got connected to the Métis people here,” Lucier said.